The McFarland Chocolate Fest will be held October 6, 2018, at the Madison Curling Club at 4802 Marsh Road in McFarland from 7 to 9 PM. Imagine an elegant evening of candlelight, pleasant music, champagne and all the dreamy chocolate desserts you could ever desire. There you have it – the McFarland Chocolate Fest! All proceeds of this marvelous affair benefit the historic Larson House in the heart of McFarland. See Video on You Tube. 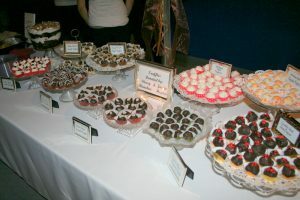 Thanks to those who are donating their homemade chocolate desserts, beverages and items for the silent auction. This is the major fund raiser keeping the Larson House Museum open for all to enjoy. The best bakers in McFarland will tempt us with their prized offerings where the major ingredient is CHOCOLATE! For a pleasant break from the many chocolate desserts, there will also be a fruit and cheese table available at no extra charge. 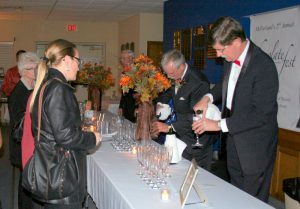 The silent auction tables are always very popular. Live music is provided by some talented musicians. Coffee, cider and champagne and all the chocolate you can eat is free with your $20 ticket. Some tickets will be available at the door for $25. This event is very popular so you are encouraged to buy tickets at the McFarland State Bank, at the McFarland House Cafe or buy online and pick them up by will-call. Tickets will be available for sale starting August 1, 2018. Tickets are limited so please plan ahead.